It was an evening of romance and colorful roses which initiates that Relationships are made in Heaven. With the Arabian Sea on one side and green undulating lawns on the other, the stunning wedding enclosure was fully clad in blush pink and lily white – flowers, candles, lanterns, ribbons and varying embroidery – sparking the ambience. 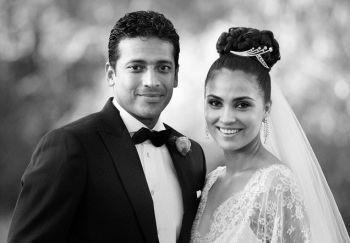 Tennis ace Mahesh Bhupathi exchanged wedding vows with former miss universe Lara Dutta in an cherished Christian ritual at the sunset point of the erstwhile Portuguese fort of Aguada in Goa. The wedding was mostly attended by family and close friends; along with the attendees were Mahesh’s Davis Cup team members – Leander Paes, Somdev Devvarman and Rohan Bopanna. Former tennis great Vijay Amritraj with son Prakash also attended the wedding. Though the Bollywood big names were missing, in attendance were Ritesh Deshmukh, Ravina Tondon, Dia Mirza, Priyanka Chopra, Celina Jetley, and Boman Irani. Mahesh looked very elegant in a black tuxedo, but it was Lara who drew gasps as she entered the site. Lara looked utterly striking in an off-white form-fitting creation by Elie Saab. The all-lace outfit with a 10 metre train held up with a diamond circlet was compensated by the flower girls in a toning shade. Bhupathi said "Lara, when I first met you, this day was a dream. Today it is reality. When I’m on the tour, not a day goes by without me wishing I was home with you instead, so even when I’m gone I am with you." Further adding on, he also said, “You are my companion, partner and best friend. I promise to stick by you through hits and flops. I look forward to growing old with you." Mahesh and Lara, who were married in a civil function earlier in the week, sat during the rest of the hour-long ceremonial holding hands. Dinner and dance followed the Christian wedding, with the pink and white theme spilling over to the greeting which was all concerned with dining and dancing. Bollywood mixed with Hollywood as feet tapped to an array of numbers which was healthy harmonized by the cuisine.